With each of these 3 components there are sometimes a confusing number of choices. 1. With Air Cleaners there are two basic performance choices, and an endless number of "Looks" to choose from. The difference between most air cleaners and the DK Custom Outlaw A/C Systems is the Quality of the Air. 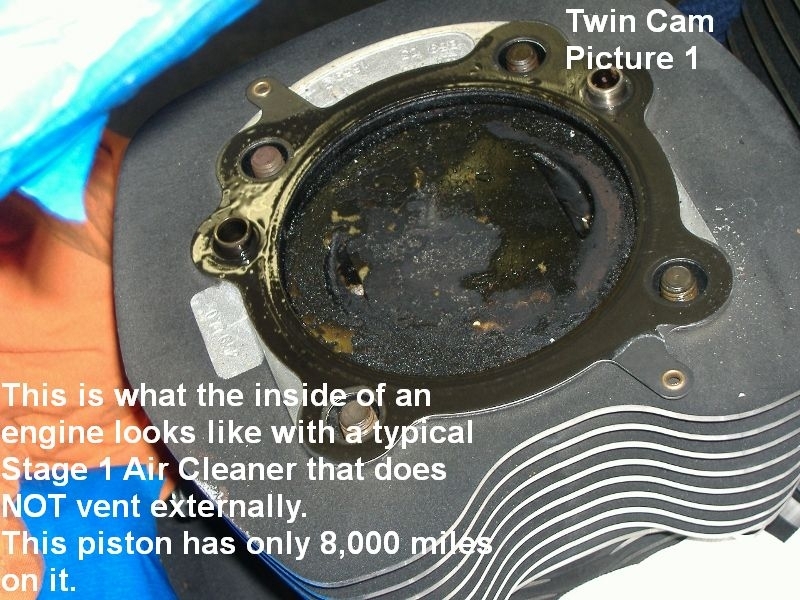 Performance Choice #1 - Unfortunately the EPA mandates have Harley-Davidson, and almost every aftermarket air cleaner company, pushing the blow-by into the air cleaner. What comes out of the breathers is primarily exhaust gases and oil, it is also hot. This is counter-productive to performance & engine longevity. Harley engines perform better with cool dry air & gasoline, not hot, oily air and gas. Additionally, the exhaust gas has a lower oxygen content, displacing oxygen on each combustion stroke. This type of air cleaner is a poor performance choice. Performance Choice #2 - The Best Performance Choice is an Air Cleaner System that allows only clean dry air into the intake. 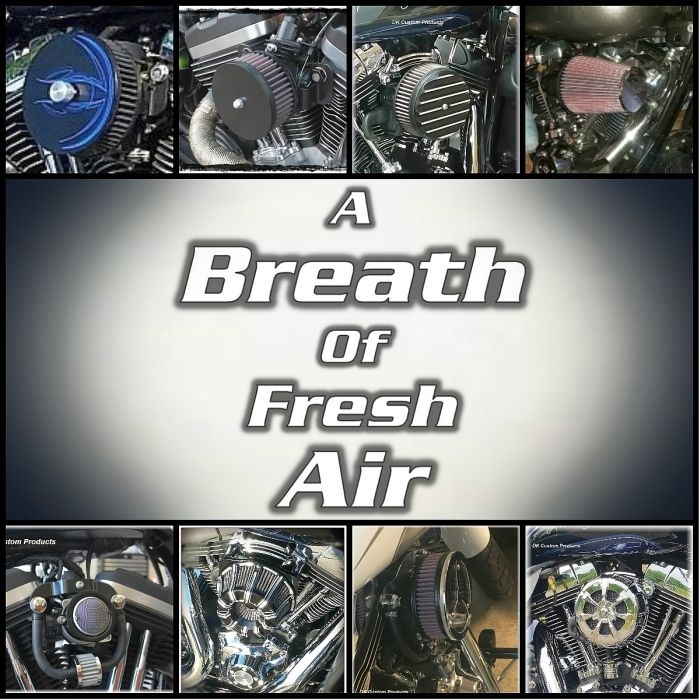 DK Custom Products Line of Outlaw Air Cleaner Systems are Air Cleaner Systems that utilize external breathers, allowing only Dry, Clean Oxygen rich Air into your intake. The DK Outlaw Line of Air Cleaner Systems has Many Looks to choose from. You can see them all at this LINK. Photo of the inside of an engine with a stock air cleaner or a typical "Stage I" air cleaner. Photo of the inside of an engine that allows only clean dry air into the intake. You can see a LARGE Selection of Top Quality Slip-ons and Full Exhaust Systems HERE. Whether you are keeping your current exhaust, adding Slip-ons or a Full Exhaust System, they all will be enhanced with the addition of some TTI's. The "W" Series" Thunder Torque Inserts (TTI's) will slightly deepen the tone, and, more importantly, will increase the low and mid range power by 5%-20%, by reducing engine pumping loss, & increasing exhaust gas velocity. The Patent Pending TTI's are literally the most power increase per $ spent of any mod that can be done to a Harley-Davidson motor! If you're wanting a unique or one-off look, along with a great sound and great performance, we also have DIY Exhaust Builders Kits. If you would like to keep your current exhaust system, we strongly recommend that you supplement them with some Thunder Torque Inserts for a bump in low and mid range power. 3. In the Tuning (re-mapping the ECU) arena for EFI Harley's, there are dozens of choices. Ranging from doing nothing to spending as much as $600, or more, for a tuner and dyno tuning. 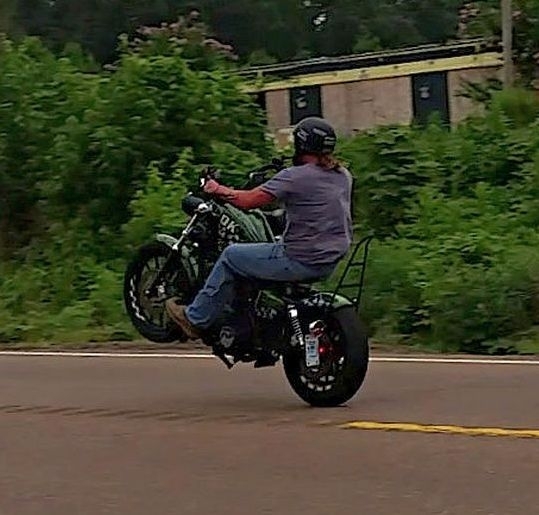 While it is possible for the modern Harley to run a free flowing air cleaner and free flowing exhaust without doing anything in the tuning/fuel managment arena, our experience has shown that it will run hotter than is good in the long term, AND, will not run nearly as well as it could. In the last 10 years HD has gotten leaner and leaner with the Air Fuel Ratio, causing more & more heat. While the ECM will adjust for changes to a certain degree, they will never adjust past the "too lean" factory (EPA mandated) settings without the help of a Fuel Management Device. Our experience with thousands of bikes has shown that the best economical choice is one of the XiED Products. These are Plug-n-Play fuel enrichment devices that will give you 80% - 90% of the benefit of a Full Blown Tune for about 20% the cost. We have Thousands of Customers that are very happy with their cooler running, stronger accelerating Harley's as a result of using an XiED device. In our experience, the next step up in tuning is an FP3. It is an excellent flash tuner for late model Harleys. While not as powerful as the Power Vision (see below), it works very well with stock Harleys, and Stage I (free flowing air cleaner & exhaust) bikes to deliver a tune that is MUCH stronger and cooler running that the stock tune. It also comes with an Auto Tune feature that allows you to ride and get the tune dialed in for your specific set-up, riding style and environment. The FP3 is also a ton of fun to use. It interfaces and displays via your smartphone (iPhone or Android) making it super easy to use and display useful information. The Fuel Pak FP3 is a very solid choice for Stage I Upgrades. ...All without having to spend any money on Dyno tuning. With the Power Vision you can choose to Dyno tune if you wish, but, since the Power Vision comes with a Customized Tune from us, plus an Auto-Tune Feature, the vast majority do not find it necessary. The Target Tune is the Ultimate in Tuning for EFI Harleys. It works in conjunction with your Power Vision, putting the entire MAP in Closed Loop. Net result is that 99% of the time you will end up with a Better Tune than if you spent $1000 on a Dyno Tune...and it is Dynamic, you will Always have a dialed in tune, because it is constantly adjusting, As You Ride! Stage I Kits are NOT Created Equal! DK Custom Specializes in making Stage I Upgrades that produce Significant, Noticeable Improvements in Performance, Power & Engine Longevity. Street Developed, Street Tested & Dyno Proven! ***One Final Note: To get the best out of any Stage I, including ours, it is important that your Twin Cam Engine is running at the optimum temperatures. If it is not, it can make a 10%-15% difference in power output. 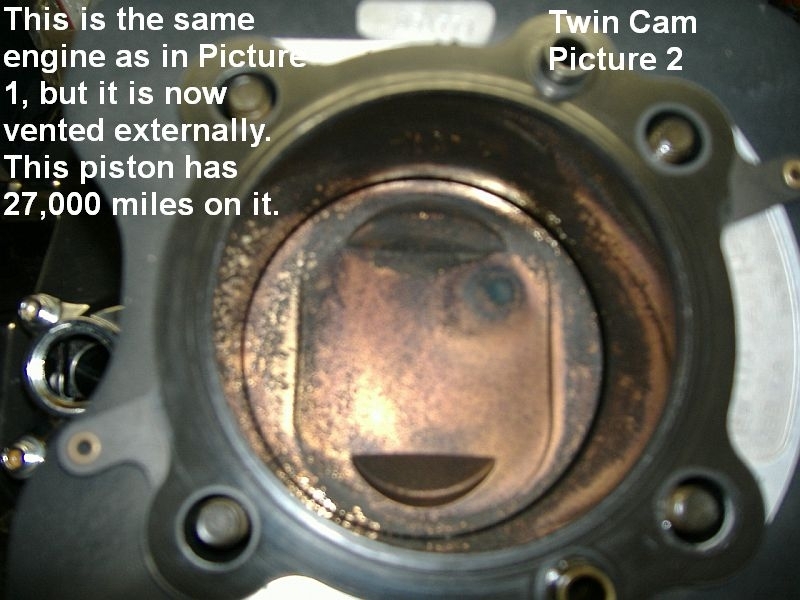 Please Click HERE to see information on achieving optimum running temperatures for your Twin Cam Motorcycle.